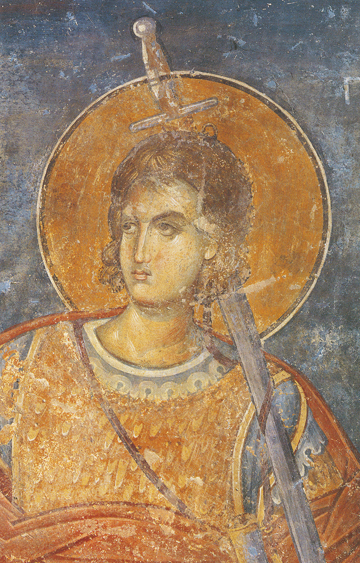 St. Prokopios was born in Jerusalem in the late 3rd century of a Christian father and a pagan mother, and was named Neanias. After his father died, his mother, Theodosia, raised her son in strictly Roman pagan ways. Neanias entered military service in the palace of the Roman Emperor Diocletian. When Diocletian began to persecute Christians, he sent Neanias to Alexandria with a cohort of soldiers to eradicate Christians. On the road to Alexandria, there was an earthquake at night, as the Lord appeared to him saying, “Neanias, where are you going and against Whom are you rising up?” In fear and amazement, like St. Paul had experienced, Neanias replied, “Who art Thou Lord? I am unable to recognize Thee.” Immediately a cross like crystal appeared, and a voice came from it saying, “I am Jesus, the crucified Son of God.” Neanias went to Jerusalem to oppose an army attacking it, told his mother that he was a Christian, and then went before the authorities to confess his strong faith. He was judged, condemned, tortured, and thrown in prison where he was baptized and renamed Prokopios, dying a martyr’s death for Christ.